Neil Armstrong (1930 – 2012) was an American astronaut – who gained the distinction of being the first person to both land and walk on the moon. 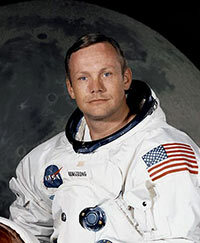 Armstrong was born 5 August 1930 in Wapakoneta, Ohio, US. He attended Blue High School and took flying lessons while still a student; by the time he was 16, he had gained his flight certificate. Aged 17, he studied aeronautical engineering at Purdue University, turning down a chance to study at MIT. His studies were partly financed by the US Navy and, after his first two years, he was called up to the Navy for flight training, where he qualified to be a naval aviator. In 1951, he was sent to the Korean War where he took part in active service, including an emergency ejection after his plane was hit by anti-aircraft fire. He flew 78 missions during the Korean War before returning to Purdue to finish his degree. In 1955, he graduated with a B.A. in aeronautical engineering. After graduation, he applied to be a test pilot for NACA – the High-Speed Flight Station, at Edwards Air Force Base. This involved testing new high-speed aircraft for the US military. This included pioneering new rocket planes, such as the Bell X-1B and North American X-14. 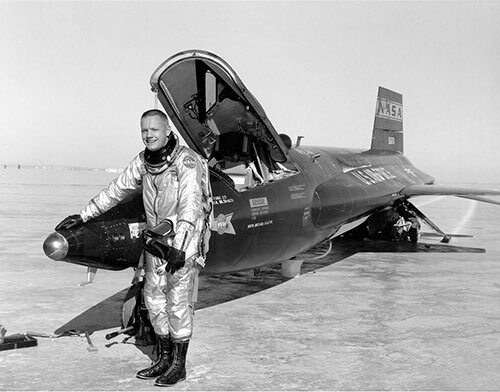 As a test pilot, Armstrong became known for his natural flying ability and willingness to take risks – stretching the boundaries of what was possible. He was also one of the most technically capable engineers. In 1958, he was selected for the US Air Force’s Man in Space Soonest programme. Later, in 1962, he was later selected for the Apollo program – which aimed to put a man in space and land on the moon. In J.F. Kennedy’s address to Congress of 25 May 1961, he had put landing on the moon as a primary goal for America. The space project was also infused with Cold War symbolism with an unofficial space race taking place with America’s ideological enemy – the Soviet Union. After the Soviets became the first to put a man in space, there was even greater pressure for America to win the prize of putting a man on the moon. On the 40th anniversary of the Apollo Mission, Armstrong said that the moon race was a helpful diversion from Cold War tensions. In the early 1960s, Armstrong took part in Project Gemini – flying spacecraft in long-duration space-flight. This gave NASA and Armstrong valuable experience for the more ambitious targets of the Apollo missions. 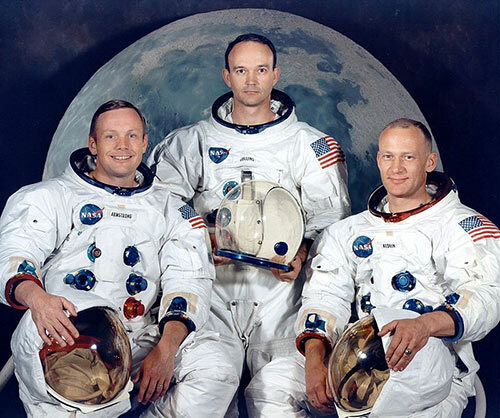 In December 1968, Armstrong was chosen to be the commander for Apollo 11, which would be the first planned mission to dock and land on the moon. Armstrong was chosen to be the first person who would have the distinction of walking on the moon. Some suggest NASA chose Armstrong because he didn’t have a large ego. His fellow crew members were Michael Collins and Buzz Aldrin. The Apollo 11 launch was a success, and after a tricky descent, Armstrong manually landed the lunar module on 20 July 1969. Armstrong said later that it was the lunar landing, which was the trickiest part of the trip. It’s a great honor and privilege for us to be here representing not only the United States but men of peace of all nations, and with interests and the curiosity and with the vision for the future. It’s an honor for us to be able to participate here today. On their return to the US, they were fêted as heroes and embarked on tours of the US and the world. This included a vista to the Soviet Union in May 1970. After the Apollo flight, Armstrong retired from space missions and accepted a teaching position at the University of Cincinnati. He also served as a spokesperson for several businesses, including advertising campaigns for US car producer Chrysler. Armstrong also served on crash investigation commissions which looked at aircraft disasters, such as Challenger. Armstrong married his first wife Janet Jearon in 1956; they had three children. They divorced after 38 years of marriage. In 1994, he remarried Carol Knight. Armstrong remained without political affiliation, though he declared himself in favour of state rights, and against the US acting as the world’s policeman. He didn’t have a religious affiliation but described himself as a deist. Many friends speak highly of Armstrong’s character saying he had a natural humility and was careful to avoid boosting of his unique role. John Glenn, the first American, to orbit the Earth said of Armstrong. Armstrong died on 25 August 2012, aged 82 from coronary complications. 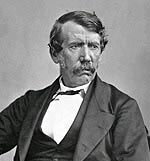 Famous Americans – Great Americans from the Founding Fathers to modern civil rights activists. Including presidents, authors, musicians, entrepreneurs and businessmen. Famous Adventurers – Famous adventurers and explorers, including Christopher Colombus, Marco Polo, Roald Amundsen and Neil Armstrong.